When you dig into a cheese pizza or bite away a hotdog, do you count the calories in your head? Is the thought of losing those calories running your mind crazy? Well, then it’s time to put an end to all introspection and get your very own Horizon Fitness T74. Straight from the beginning, we would like to point out that this treadmill is a no-frills serious machine meant for specifically one goal only – to run, jog and walk away calories! With a 2.5 horsepower motor, this machine is easily foldable, smooth and powerful. It has eight preset programs, speed and incline limits of 12mph and 12%, respectively. Additionally, it has a cooling fan, holders for keeping water-bottle or miscellaneous items, great LCD and LED display and built-in heart rate monitors. Along with being easy on the knees and joints, it also happens to be easy on the pocket. This T74 model of Horizon scores very high when it comes to space utilization. Measuring 70 x 55 inches when completely open and flat, it can fold up to 35 inches in length, 34 inches wide and 60 inches tall, implying that it saves a lot of space when folded. Moreover, it is equipped with two hydraulic shocks, which facilitate easy raising and lifting of the deck, in turn making it easy to fold the machine. As far as noise is concerned, this machine will not give you much to complain about. It is quite smooth and does not cause any obstruction in listening to music or watching television. The Horizon Fitness T74 has eight incredible preset workout programs, which help not only in quick operation of the machine but also in setting the required workout intensity that one desires for. These programs comprise one each of manual, interval, rolling, weight loss, hills and heart rate zone and two custom programs. Thankfully, each program is quite distinguished from the other so you actually experience varying results. The Fitness T74 model has a 2.5 horsepower continuous duty motor, which keeps the RPM low consequently preventing the motor from making loud unpleasant noises. While many competing treadmills offer a higher horsepower motor, its 2.5 HP motor is not any less powerful. In fact, it suffices to ensure that the equipment is smooth, fast and delivers all functions as advertised. Using complicated machines to exercise can really take a toll on your body. Hence, the easier a treadmill is to use or operate, the more user-friendly it feels. This T74 is extremely easy to use. To begin with, assembling it is quite simple and can be done solo by following instructions included with the packaging. And although it has too many features, using it isn’t that tough. Thankfully, it has easy control buttons for setting the desired speed and incline. Further, the speed increases in increments of only 0.5mph making it simpler to increase or decrease the speed instead of facing a sudden rise or fall in speed. The LCD backlit display for all the functions plus a separate LED display for speed and inclination help in keeping a clear track of every routine. The running area measures 20 x 55 inches giving enough leg space for an average height to tall person. The deck is comfortable for any age group and adequately cushioned for comfortably running, jogging or simply brisk-walking. Also, it does not cause any pressure or pain on the knees and/or other joints. In short, this is the only treadmill with its affordable price tag that happens to boast such a wonderful belt and deck system. Along with all the features mentioned, this T74 fitness machine comes with an in-built heart-rate monitor in the handles and also a cooling fan to help keep your liquid loss under control. However, the biggest deficiency in this product is the absence of an mp3 port. This may discourage certain music savvy users from buying it, since most treadmills these days usually have a music port or an audio jack. Nevertheless, if you think you can deal with this omission and a music port isn’t that necessary, you don’t have to think twice before purchasing the Horizon T74. Hydraulic mechanism for easy folding, raising and lowering. Eight preset programs, not noisy, smooth operation. No music compatibility port, requires dedicated space, cannot be frequently shifted from one spot to another. 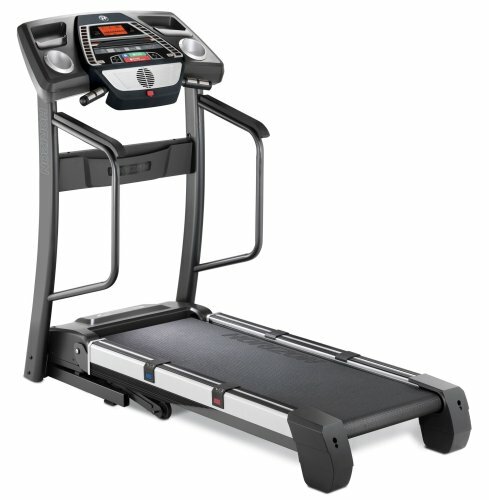 All in all the Horizon Fitness T74 is a basic treadmill model with easy-to-use controls, a moderately high horsepower motor, great LCD and LED displays, eight preset programs, heart-rate monitor, item holders and good deck size with proper cushioning and comfort. Additionally, its biggest plus point is that when not in use it can be easily folded with the help of the two inclusive hydraulic shocks. Forget about the missing mp3 music port, considering everything else it sports for a nominal price tag and decent warranty cover, the T74 is worth purchasing.